No filling in forms, subscribing to topics you might like, everything you see is based on content you have viewed in the past, and the more you browse the more Lumi understands what makes you tick. 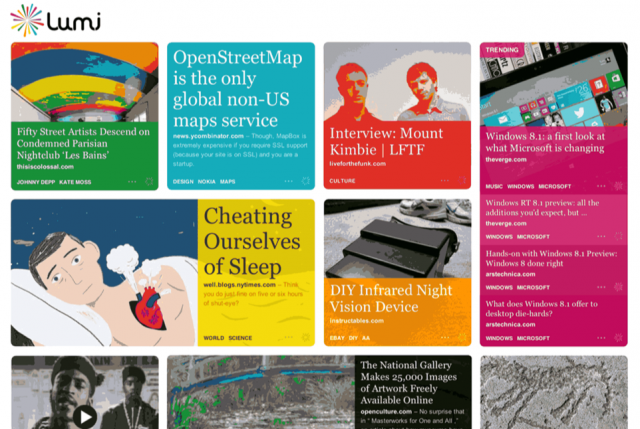 Lumi also lets you save interesting content in a similar way to Pinterest or Flipboards magazines feature. Every song I have listened to on Spotify, iTunes and even You Tube is recorded onto my Last FM profile where over 57,000 listens have been recorded and stacked into my very own personal music chart. Based on my listening habits it can tell me exactly what kind of music I will like too but this reminds me of an Interview with Noel Gallagher last year where he warned that being spoon-fed what you like is not as good as it initially sounds. It then occurred to me that everywhere I turn websites are giving me more of what I want, but is this really a good thing? Spotify and LastFM give me the music that I will like, NetFlix gives me more films, TV and documentaries that I will like based on my past viewing. Even Amazon will do its best to tell me to buy more similar things to what I have brought in the past. Now Lumi will only show me websites that it thinks I will like which although it certainly cuts down on the noise of the internet, am I creating my own form of media isolation? A utopia where I am only ever given things that I will like may sound like heaven but am I really reinforcing my own current opinions and thoughts, whilst closing my mind from anything different from the norm? With this is mind, I will continue to utilise these tools as a guideline for everything I love in life, but I will making a conscious effort to seek out alternative, new and exciting media that I wouldn’t normally do to avoid a future where everything is the same. Maybe Damon put it best when he sang “Yes the universal’s here, here for everyone” and you know what? It really, really, really could happen. Despite my initial concerns, Lumi is proving unique and interesting content to me without any effort required from myself and that can’t be all bad.